it’s not easy being green…says who? long before talks on global warming and recycling were everywhere, my first valuable lessons on loving mother nature came from my parents. early on in life we were taught the simplest ways to help save the environment like turning off the faucet when not in use, using basin when we do our “pag-uurong” (that’s washing the dishes), keeping the opening of the refrigerator door to a minimum, cleaning the surrounding and not being a litterbug and unplugging electric appliances when not in use. later on in life, i think the habit was stuck on me and it has become a way of living. while still working, you will find me carrying my thermos around the office everyday, saves loads on coffee cartons and plastic cups! i would also always have spoon and fork and a set of microwavable stashed in my locker so i won’t have to use plastic come eating time. i would refuse the plastic utensils and tissues when having takeouts or takeaways. i would even bring home the microwaveable my friends would just otherwise throw away, i recycle them at home and there are just numerous ways to reuse them. old habits die hard and now that i am a mum myself, i still carry on with what my parents taught me and more, i segregate the garbage, keep what’s recyclable in a different container (mineral water bottles, milk cans, paper and card boards, plastic caps) and sell it to the neighborhood junk shop, i even joined world wildlife fund . hopefully i will be able to pass this on to my son so he will be a nature-loving, earth-friendly guy when he grows up! for mother earth, a simple act of kindness can go a long way and every little thing we do counts. today you can start by turning your blog carbon neutral, and then try to do one good deed for mother earth each day. if you run out of ideas check out my green tips on the side, it will give you loads of suggestions to help you turn green, (the other day i just found out i can use milk cartons as alternative pots for plants, so from now on i will never be throwing my nestle milk tetra), or better yet get you own green tips here for your blog. at the end of the month you would’ve done 30 good deeds and if all of us will start maybe one day our planet will heal and hopefully we will sure have a better planet for our children and the generations to come next. cheers to a healthier mother earth! i will be counting down the days to 19 November with mixed emotions, delighted and ecstatic that finally the long wait is over and that we will, at long last, see our fave book in full living colour, bearing in mind the scenes from the book which i would just love to see on the big screen (how they’d manage to break into Gringots, the scenes in the forest where they’ve gone hiding plotting their next course of action, and many more) and on the other hand, sad, knowing that this will truly be the second to the last film and then there will be nothing more. The happy/sad ending. The story which has been part of our family for what 10 years or so will be part of history forever. It has converted many a faithful amongst us and long after the curtain is drawn on the last installment for the Deathly Hallows, we will reread and reread the books, watch and review the films and yep recount it to our children during storytelling tuesday nights and therefore, keep the legend of Harry Potter alive! See you on November 19, in cinemas where harry will visit, for now let me just wipe the dust off this Deathly Hallows copy and brush up on my potter knowledge! Note: this is a review i did on Deathly Hallows ages ago. First published on my multiply account, 03 August 2007.
did i tell i had goosebumps holding my copy for the first time? Bye, bye brown curls, we will miss you when you’re gone…. 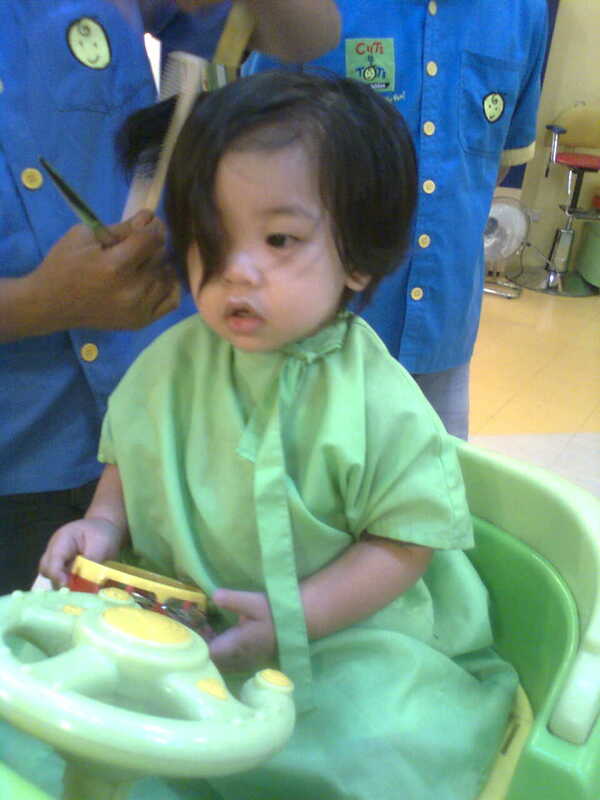 Jared had his first ever haircut last September 17 . There is simply no other choice that we opted for Cuts4Tots to have his curls done. Great facilities, accommodating staff and the person who cut my son’s hair just did wonderfully. However he managed to have Jared sit through the entire session beats me. He’s just behaving at his best, sitting there, nary a care in the world, like he does it all the time. And I couldn’t be prouder of my son! Well, maybe the books and the toys did a little to let him stay put, plus Barney singing in a tv set in front of him must have done him good. You see that is his current fixation, enjoying the “I love You” song from the purple dino and friends. Cuts4Tots service (Php 295.00) include the whole nine yards, with shampoo and blow dry (which i beg off since I just shampooed baby’s hair earlier, plus the idea of having his hair blown dry is not that tempting to me!). 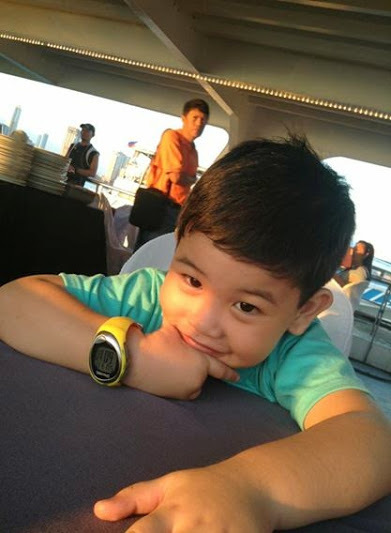 It also includes a certificate (for an additional sum of Php 195.00) with baby’s before-and-after-the-hair-cut pics and a lock of hair as a memento. And they even had the receipt under my baby’s name (how cool is that)! What more can I ask for? Another milestone on my baby’s book and I have several photos here to document the occasion. It was a pleasant experience and am looking forward to more, so bring ’em on..how about you, how was your baby’s first haircut?